Routine and consistency are one of the most important elements of successful caregiving for anyone with Dementia, even more with Lewy Body Dementia (LBD). Times change. So do schedules. While some changes are necessary, most can be eased into, or adapted, for best results. Our loved ones with LBD are not always able to maintain a schedule themselves because of medication issues, excessive daytime sleepiness, disrupted sleep patterns from REM Sleep Behaviour Disorder, anxiety or agitation, and many other reasons. For best results, keep things on an even keel and have regular patterns of the day, while allowing for flexibility to accommodate the many wild fluctuations Lewy brings. This will provide a sense of stability and calm that your loved one will benefit from. It will also likely help in establishing regular sleeping patterns, which is critical to your own health as well. 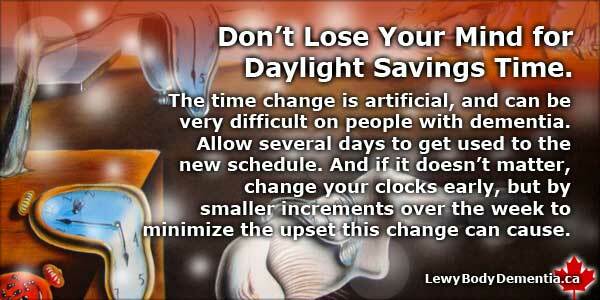 Daylight Savings Time brings a very unwelcome change to routine. To minimize its negative impact, it’s best to work into the time change incrementally. Try adjusting your clocks by ten minutes a day, rather than sixty minutes in one day. It’s more difficult in the spring, where you lose an hour of sleep. This is associated with significant health risks (higher heart attack and stroke, for example) as well as automobile and pedestrian fatalities because people are over-tired in the days following the time change. So make that change gradual — you will likely benefit more from the diminished upset and gradual change than just slavishly following the clock. If it’s impossible to be very gradual with the change, even doing the change over two days is better than one. Once the change has happened, allow some days for it to work into your routine. Your entire schedule is shifting by a full hour, and this is not something most people adapt to in a single day. Many people take a week or weeks to adjust. Some never adjust, but just adapt. This is completely normal. Sundowning is tied to the circadian rhythms, and the cycle of the sun, not the clock: so it’s onset is later in the day during the summer than during the winter months, with its shorter days. Flexibility to accommodate this is another reason to adjust your schedule gradually, and particularly to diminish the impact on routine of the clock changes that come with Daylight Savings Time. Stress from lack of sleep in the care partner can make sundowning worse in the person you care for, because they will likely sense and react to it. Make Appointment Times Work for You, Not The Doctor’s Assistant. Appointments may require you to change your schedule. Always ask if you can choose your appointment time or reschedule an appointment to suit your requirements. Medical administrators may often seem imperious and impervious, but they are usually open to a change when asked, especially if you advise them of the difficulties and distress a bad appointment time may cause. An early morning appointment may require significant changes to routine to accommodate, if you have to rise early, prepare your loved one, and make a journey to your destination — especially if there is traffic issues or distance involved. Few people ask for alternate times, assuming the one the scheduler suggests is the only one available. This is not usually the case, and may just require you to ask to have the appointment within another block of time. Having some flexibility on your part will increase the likelihood of mutually acceptable timing. Getting a good appointment time means you can have a more regular sleep pattern, with a consistent morning routine and leave at a time convenient for you, you’ll be more relaxed, and your loved one will be able to withstand the confusion and upset that often accompanies an appointment much better. That should help you rationalize the attempt to get a better time slot. Caregivers need to make sure they get enough rest as well, so this is not just a LBD issue. Carers are chronically over-tired, and adding an early rise time is an unwelcome, and dangerous precedent, so minimize its impact as well as possible. I have found that Melatonin helps me to adjust my sleep cycle when it has been unexpectedly disturbed. It is a hormone, not a “drug” technically, but always check with a medical professional before trying this. It has also been successfully used by many people with Lewy Body Dementia, and may be helpful to investigate with their specialist if they could use it safely to improve their own sleep. Like with medication changes, the old rule also applies to changes in time, schedule and routine: start low, go slow.